Table reserved for the aperitif with espresso breadboard and one drink: € 10 per person, minimum two people. It is also possible to order from the menu on the first warm (from € 3 for half portions and € 5 for standard portions) and desserts. Table reserved for the aperitif with private buffet (which includes various appetizers, hot and cold first courses, and meat) and a head drink: € 15 per person, minimum ten people, or € 18 with even the personalized dessert. For after dinner only, from 23.00, the cost of the table with consumption varies according to what is ordered, mainly the consumption ranges from 6 to 10 €. 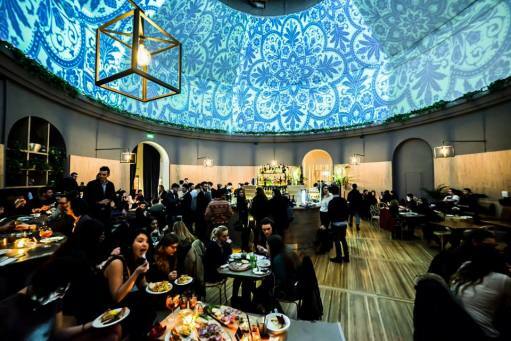 Dome Firenze is in the historic center, open every evening from 7.00 pm to 01.00 am, a stone's throw from the SMN central station and the ring road avenues. A very particular place, a circular room furnished to the garden and surmounted by a huge dome, more than 20 meters high, transformed into a charming lounge bar. The word "dome", translated from English, means "dome". Special features of the Dome are the plays of lights and the animations projected directly on the dome, which will project you into a fantastic setting. Ideal location to celebrate an anniversary, leaving your guests open-mouthed.